Mendocino.org for information about Mendocino County. A guide for the best Mendocino lodging, activities, food, and places to see. 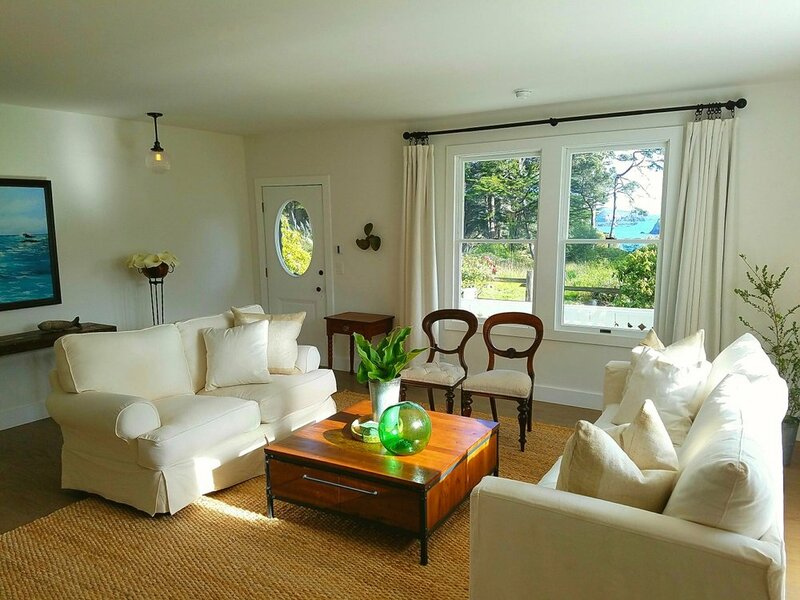 Located in Little River just two short miles from the tiny hamlet of Mendocino sits the most perfect vacation rental cottage on the entire Mendocino Coast. It is a completely remodeled, one-bedroom hideaway right at the top of a beach trail at Van Damme Beach. This trail takes you down to the private sandy beach where otters play and seals feed each morning. Directly behind the house is a pine forest with trails that take you out along the stunning headlands at Van Damme Sate Park where you'll find millions of wild flowers in spring, golden waving meadows in summer, the crisp blue skies of fall, and the crashing waves of winter. The house is cozy with its radiant floor heating throughout. The marble and glass bathroom with heated floors and heated towel rack is generous and offers views of the garden and the ocean. The gourmet kitchen is perfect for cooking all meals in, if you choose. 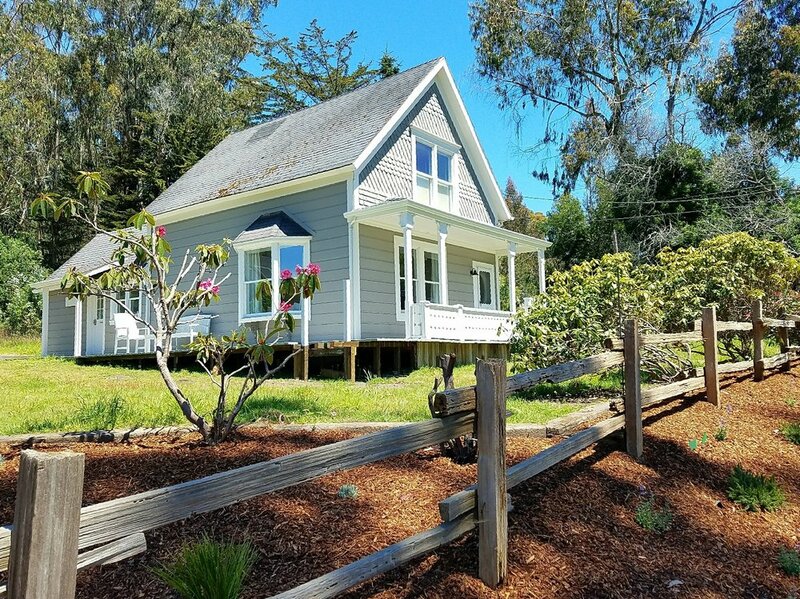 The cottage is close to many world class restaurants like Wild Fish (1/2 mile south), Cafe Beaujolais in the Mendocino Village (2 miles to the north), the Ledford House in Albion just 10 minutes drive to the south. You are just steps away from all the included amenities available at The Inn at the Cobbler's Walk and The Inn & Lodge at Glendeven, all under the same ownership. With crashing waves, towering redwoods, pristine rivers and coastline, miles of vineyards, top restaurants, and some of the best wines and brews, Mendocino California is a world class destination. Traveling to the Mendocino Coast in California for a vacation - we have the perfect inns for a weekend trip, extended vacation or special holiday. We are the source for travel in Mendocino, Fort Bragg, Little River, Albion, Elk, Point Arena and more. Guide also available for our Restaurants. Enjoy a Winery tour or maybe try a Mendocino Brewery or Pub. Mendocino is famous for its Wines, Beers and Ales. For fine dining, Mendocino has some of the best Restaurants in California. We also have restaurants for casual dining or Pubs, Micro-Breweries and even a great Pizza Parlor. All of our great restaurants have websites to browse. Find out where to go on the Northern Coast, where to shop, where to find the Mendocino Parks and Mendocino Beaches or Mendocino art shows, music festivals and Mendocino galleries and exhibitions. Mendocino Coast is a rich environment with many local communities - Mendocino, Little River, Caspar, Comptche, Albion, Fort Bragg, Boonville, Navarro, Anderson Valley, Philo, Elk, Gualala, Laytonville, Westport, Cleone, Ukiah, Willits, Hopland and more. For your next vacation, visit Mendocino ! all the the many amenities and activites. Find the best Mendocino Hotels and Inns here. The New York Times says Mendocino is the 3rd best place to visit in the world!